Palestinians work around the clock to rebuild network of underground smuggling tunnels severely hit during Operation Pillar of Defense. Rafah's biggest industry is back in business: Gazans are rebuilding the network of underground smuggling tunnels crisscrossing the Egyptian border that were pummeled in a recent Israeli offensive, restoring the illicit conduit for consumer goods and weapons so crucial to Hamas rule. around the clock with workers carting in cement, bricks, gravel and scaffolding. The quick rebound has raised questions about how much damage Israel inflicted on the tunnels during last month's eight-day air offensive. Anwar Abu Lebdeh and seven other workers were laying bricks on a recent day to rebuild the entrance to a 500-meter (550-yard) tunnel battered by an Israeli airstrike last month. Nearby, workers hauled cement sacks on their shoulders, and a bulldozer lifted gravel onto a nearby truck. After loading up at tunnel sites, trucks lumbered over to Hamas government points to pay taxes on their cargo. "It's our source of life, this is the only job we could find. I have been working here for five years," said Abu Lebdeh, 24, who had to slog through mud left by heavy rain to get the job done. The tunnel industry has become key to Gaza's economy since Israel and Egypt imposed a blockade on the territory after Hamas seized power there in 2007. The tunnels ferry in a wide range of items besides essentials, including Chinese motorcycles, farm and zoo animals, appliances — and large Iranian rockets that can hit Tel Aviv. Responding to months of daily rocket salvos from Gaza, last month Israel unleashed its air force, starting with an airstrike that killed Hamas commander Ahmed Jabari. In eight days, the Israeli military carried out more than 1,500 airstrikes on militant targets, including rocket-launching sites, weapons storehouses and dozens of the roughly 500 smuggling tunnels operating under the short border. Israel claimed it "successfully targeted 140 smuggling tunnels in order to impair Hamas weapons smuggling capabilities." Prime Minister Benjamin Netanyahu this week told reporters that the offensive had "dramatically reduced" the Hamas arsenal. Hamas has also claimed victory. Despite losing dozens of fighters, Gaza militants managed to fire some 1,500 rockets into Israel during the violence, hitting the Tel Aviv area several times and ending with a heavy barrage on the last day before an Egyptian-brokered cease-fire took hold. It remains unclear how hard the smuggling industry was hit. Hamas estimates Israel bombed 60 percent of the tunnels, said government spokesman Ihab Ghussein. Some were damaged and quickly repaired. Others were flattened. Tunnel operators say dozens remain out of commission, but they are quickly rebuilding them. The Israeli army acknowledges that smuggling has resumed, though it would not say whether this includes new weapons. Tunnel operators, pointing off into the distance, said there are tunnels reserved exclusively for Hamas shipments, presumably weapons. Evidence of the vast amounts of weaponry in the tiny territory came after Israel's offensive. For the first-ever visit to Gaza over the weekend of the exiled leader of Hamas, Khaled Mashaal, thousands of masked Hamas militants deployed throughout Gaza to protect his convoy, brandishing rocket-propelled grenades, assault rifles and anti-aircraft weaponry. The tunnels run underground from Gaza to houses on the Egyptian side of the border. While Egypt has launched periodic crackdowns on weapons smuggling, smugglers say the Egyptians generally ignore the movement of construction materials, fuel and consumer goods. There was no immediate comment from Egypt. The smuggling tunnel business has been around for at least 15 years, but it got a major boost when Israel and Egypt's then-President Hosni Mubarak clamped the borders shut after Hamas seized control of Gaza from the forces of Palestinian President Mahmoud Abbas in 2007. Israel also imposed a naval blockade, saying it was needed to prevent weapons from entering the territory. After an Israeli commando attack on a blockade-busting flotilla killed nine Turkish activists in May 2010, Israel was forced to significantly ease the overland restrictions. It allows most consumer products in through its cargo crossing with Gaza, excluding what it calls "dual-use" items that Hamas might be able to use for fortifications or other purposes That includes most building materials. Israel says militants could use cement to build bunkers and metal rods to build weapons. Israel also bans most exports and maintains its naval blockade. After the November fighting, Israel and Hamas began indirect, Egyptian-led talks over new border arrangements. The militants want Israel to lift what remains of its blockade. In return, Israel demands an end to arms smuggling into Gaza. The talks promise to be difficult, and no decisions have been made, though contacts continue. As part of these talks, Ghussein, the Hamas spokesman, said his government wants Egypt to expand a passenger terminal in Rafah to handle cargo as well. This would replace the tunnels, he said, and reduce Gaza's reliance on Israeli crossings. Although Egyptian President Mohammed Morsi comes from the Muslim Brotherhood, the parent movement of Hamas, it has not thrown open the border, fearful of alienating its top aid patron, the U.S. A senior Hamas official said Egypt also has linked an expansion of Rafah to reconciliation between the rival Palestinian factions. During his visit to Gaza, Mashaal vowed that his movement would continue its armed struggle "to retake Palestine," including Israel, "inch by inch." Given the many obstacles to Palestinian reconciliation and the deep hostilities between Israel and Hamas, the smuggling tunnels will likely continue to operate. At the border with Egypt, a man who would identify himself only as Alaa said he was six meters (yards) short of completing a new, 20-meter (20-yard) tunnel. "That's my Egyptian partner, we own the tunnel and share the profits," he said, pointing to a two-story house on the Egyptian side. He declined to give his full name, fearing for his safety if he discussed the illicit trade. Workers at another tunnel were loading a truck with cooking gas canisters, others with car parts, and still others with canned food. A Palestinian man died in a landslide in a tunnel he was working in to the east of Rafah city on Monday night, security sources said. The sources told the PIC reporter that Mohammed Abu Sable, 25, was working inside the tunnel when it collapsed and buried him alive. 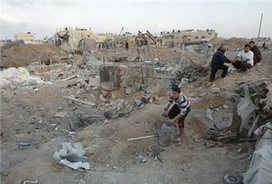 More than 200 Palestinians were killed in similar incidents involving tunnels along the borders between Gaza Strip and Egypt that were dug to secure badly needed supplies for the besieged enclave. A man was killed late Monday when a smuggling tunnel collapsed underneath the Egypt-Gaza border, medics said. The body of Muhammad Abu Sableh, 25, was recovered from a tunnel near the city of Rafah, medical sources told Ma'an. Noman Qudaih, 38, was killed in a similar incident on Sunday and in late October, three men were killed when a smuggling tunnel collapsed. Medics say that hundreds of Palestinians have died in the network of underground tunnels since Israel tightened its siege on the Gaza Strip in 2007. A man was killed on Sunday when a smuggling tunnel collapsed under the Egypt-Gaza border, medics said. 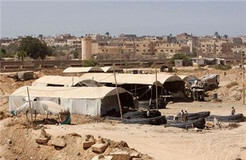 The body of Noman Qudaih, 38, was recovered from a tunnel near the Gazan side of Rafah city, medical sources told Ma'an. His body was transferred to the al-Najjar hospital in Rafah. In late October, three men were killed when a smuggling tunnel collapsed. Egyptian security services are planning an "extraordinary" crackdown on smuggling tunnels under the Gaza border, a security source said Wednesday. A man died on Monday after being electrocuted in a smuggling tunnel under the Gaza-Egypt border, civil defense crews said. Muntaser Muhammad Hussein al-Malahi, 20, was taken to Abu Yousef hospital but pronounced dead shortly after, civil defense officials told Ma'an. Medics say that hundreds of Palestinians have died in the network of underground tunnels since Israel imposed a siege on the Gaza Strip in 2006. A Palestinian man was killed and eleven others injured in the collapse of a tunnel at the Egyptian-Palestinian borders on Friday. Medical sources said that Basem Al-Shaer, 25, was killed in the tunnel collapse to the south of Rafah, noting that the tunnel was shelled during the eight-day Israeli aggression on Gaza. The sources described the condition of the injured as moderate to serious, adding that three of them suffered broken bones. They said that the workers were trying to fix the tunnel that was damaged in the Israeli shelling. Knee-deep in craters carved out by Israeli air strikes, Palestinians wielded shovels and sandbags to reopen tunnels used to smuggle in goods from Egypt to Gaza, while international aid agencies raced to replenish Gaza's depleted supplies. They were same type of tunnels that Israel, which destroyed 140 of them in its air campaign, says were used to smuggle in rockets that lashed its cities and towns by the hundreds during the recent fighting. Gaza militant groups and Israel on Wednesday agreed to a truce, but Israel will not lighten its blockade of the enclave, Israeli sources said, as some Hamas officials had hoped it might. The Rafah border crossing with Egypt also remained mostly closed to traffic. The impoverished enclave's food supply remained stable despite eight days of withering Israeli air assaults aimed at Palestinian militants, but medical supplies were running short. Workers say the attacks destroyed more than two-thirds of the cross-border tunnels that bring cement, fuel and food -- as well as weapons -- into the coastal strip blockaded by Egypt and Israel since the Hamas Islamist group began its rule there in 2007. "Our job is to bring the children and families of Gaza rice, chocolate and a way of surviving," said Hussein Seida, 21. "We were afraid for our lives to come out and work in the last few days, but now we rebuild. We'll do anything to help our people, we'll build a tunnel to China if we need to," he said, clutching a hammer in his dirt-covered hands. None of the tunnel workers interviewed said they had handled military materiel, and all said they were eager to reopen them for the sake of Gaza's civilians, and their own livelihoods. "I can count the number of tunnels working now on one hand," said long-time tunneler Ahmed al-Aida. "There's so much work to be done before we can get back to normal." Wednesday's ceasefire ended eight days of lopsided fighting in Gaza and Israel that killed more than 160 Palestinians and six Israelis. For the more than 1,000 wounded Palestinians recovering in hospitals, deliveries of medicine by the World Health Organization and other aid agencies after the ceasefire arrived just in time. "But for many people, the aid that arrived was too little, too late," Willow Heske of global aid organization Oxfam said. Basic medicines in Gaza have run low since Palestinian factions fought a brief civil war in 2007, cutting off Gaza from medical supplies in the West Bank. As casualties poured into Gaza's overwhelmed hospitals during the bombings, the dearth of medicines grew worse, but stocks are now being returned to pre-crisis levels. The World Health Organization rushed 11 truckloads of medical supplies through a border crossing specially opened by Israel. Food stocks stayed stable during the fighting in Gaza, where international food aid and imports are critical. The main commercial crossing, Kerem Shalom, was shut on Tuesday after it was hit by mortars, but has since resumed operations. Cocoa Puffs cereal, potato chips and pasta of all kinds piled the shelves of supermarkets, but the aisles were devoid of customers who chose to stay home as Israeli drones and distant airstrikes shook the air before the ceasefire took effect. Gaza farmers, fisherman and traders were especially hard-pressed by the violence, as many skipped work for the last week to dodge the bombs. But not everyone did so. As Tamer Bashier, 31, an impoverished produce vendor ventured out by motor rickshaw to replenish his stocks on Tuesday, he was killed in an Israeli air strike, said the Ma'an Development center, a local aid organization linked to Oxfam. Now safe to travel, Gaza's streets are packed. The al-Qishawi supermarket in downtown Gaza city, derelict just hours before, teemed with families on Thursday morning as stock clerks wheeled carts of canned beans down the aisles. "Do you see how things changed for us so totally," Hussein Qishawi beamed, waving groceries past the check-out scanner. "Yesterday people were stuck in their houses, and when they came, they bought enough to last them for days. Now we're almost back to normal, thank God." Egyptian security sources reported that the army and the police, operating against criminal armed groups in Sinai, will start in the coming days, a large operation that is meant at resuming the demolition of border tunnels with Gaza. Egypt halted its operations approximately 30 days ago, and is now preparing to continue the demolition after it pinpointed 50 tunnels considered to be “the most dangerous” among 2500 tunnels in the area. The Kuwaiti “Al-Rai Paper” reported that the Egyptian security forces managed to pinpoint the tunnels that are “specifically used for smuggling weapons and Jihadist fighters between Gaza and Sinai”. It added that those tunnels are different than tunnels used for smuggling food supplies and goods, as they have bigger ventilation systems and are used as hideouts for Jihadist fighters who sometimes hide there for weeks at a time due to Egyptian operations against them. The paper also said that the Egyptian forces, operating in Sinai, are preparing to attack several caves located in mountains in the center of Sinai, as intelligence information revealed that extremist gunmen, including those who attacked Egyptian security offices two days ago, are hiding there. The army will also be using the help of special forces and heavy artillery to surround the gunmen and prevent any communication with them. The Egyptian army started operating against extremist groups in Sinai attacked an Egyptian military base, and killed 16 Egyptian Border Guards and wounded several others. Three men were killed when a smuggling tunnel under the Gaza-Egypt border collapsed on Saturday, medics said. Zuheir Qassem, 25, and two other unidentified men were killed when the Rafah tunnel collapsed. On Thursday, 23-year-old Walid Nasser Marouf, from Beit Lahiya, died in a tunnel under Gaza's border with Egypt near Rafah, officials said. Egypt started closing the tunnels after an Aug. 5 attack in Sinai when gunmen killed 16 Egyptian soldiers. Egypt suspects the tunnels were used by some of the militants. Hamas says no one from Gaza was involved in the attack. Three Palestinian workers were trapped at a late night hour on Wednesday when a tunnel they were digging at the Egyptian borders collapsed. Local sources said that civil defense and other rescue teams rushed to the site to save the workers. 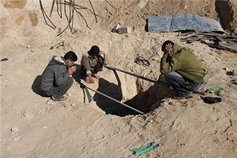 Dozens of Palestinians were killed or injured in tunnels dug under the Egyptian-Gaza borders to provide vital supplies for the besieged coastal enclave. Political bureau chairman of Hamas Khaled Mishaal discussed with Egyptian officials alternatives to the closing of Rafah tunnels that supply besieged Gaza Strip with vital supplies. Mishaal met with Egyptian intelligence chief Ra’fat Shehada along with other officials over the past two days in Cairo and discussed Arab and Palestinian developments. Well informed Palestinian sources told the PIC reporter in Cairo that Gaza developments topped the agenda of Mishaal’s talks in light of the continuation of the siege and the scarcity of medicines and food supplies. The Hamas leader called for opening the Rafah border crossing on permanent basis. The sources said that Mishaal discussed reactivating inter-Palestinian reconciliation and means of alleviating repercussion of the siege on Gaza. They said that Mishaal asked the Egyptian officials to consider means of solving the power crisis in Gaza and the Palestinian proposal of establishing a free trade zone between Gaza and Egypt. Palestinian medical sources reported that one Palestinian worker was killed, and another was injured, on Tuesday afternoon, when a siege-busting tunnel in Rafah, in the southern part of the Gaza Strip, collapsed while they were in it. The sources said that resident Mohammad Yahya Aqel was seriously injured and died of his wounds at a local hospital. Also resident Karam An-Najjar, 20, is currently in a serious condition after suffering multiple fractures to various parts of his body. 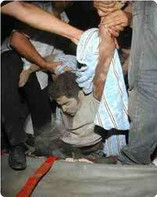 On Wednesday, September 26, one youth was killed and two were injured in a similar tunnel accident in Rafah. The youth was identified as Suleiman Ramadan Al-Masri, 20; the two wounded residents suffered moderate injuries, one of them was moved to Abu Yousef An-Najjar Hospital, while the second resident was moved to the European Hospital. It is worth mentioning that at least 206 Palestinians have been killed in similar tunnel incidents, while hundreds have been injured since 2006. The Palestinians started digging tunnels and after Israel enforced its deadly siege on the coastal region. Hundreds of Palestinians participated on Sunday morning in a sit-in on the Egyptian-Palestinian borders in Rafah area to demand the Egyptian leadership to find an alternative to the tunnels before destroying them. 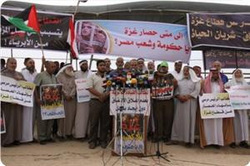 The protestors established a tent opposite the Egyptian commandership building and held banners calling on the Egyptian president to stop the demolition of Gaza tunnels before creating a permanent solution to the blockade. Hundreds of tunnels are extending underground throughout the Egyptian-Palestinian borders and used as lifelines to transfer goods and vital needs into Gaza. 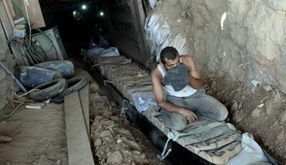 The Egyptian authorities started to demolish Gaza tunnels following the deadly attack that rendered many Egyptian soldiers dead and injured in the Sinai last August. Dozens of Palestinians gathered near Gaza's border with Egypt on Sunday morning to protest against their neighbor shutting down a tunnel network under the border. Hamas leaders, local officials and residents held Egyptian and Palestinian flags, urging Egypt to protect the entry of goods into Gaza. The Gaza Strip is under an Israeli land and sea blockade, and its sole border crossing not controlled by Israel, Egypt's Rafah terminal, is not equipped for the passage of goods. To circumvent the blockade, a vast underground tunnel network into Egypt was established, with the oversight of the Hamas-run government. After years of turning a blind eye, Egypt started closing the tunnels after the Aug. 5 attack in Sinai when gunmen killed 16 Egyptian soldiers. Egypt suspects the tunnels were used by some of the militants, while Hamas says no-one from Gaza was involved in the attack. Tunnel owners told Ma'an on Friday that just 10 percent of the network is still in operation, and the passage of goods and people through tunnels are now under strict regulation from Egyptian and Palestinian authorities. Hamas official Yousef Farahat told reporters at Sunday's demonstration the tunnels are the "lifeblood" of the Gaza Strip. He urged the Egyptian government, led by Islamist President Muhammad Mursi, to take practical steps to help Gaza's beseiged economy. "Don’t force us to lose hope in the Egyptian revolution and in the new regime," he said. He noted that the tunnels are just an emergency measure and not the only or strategic choice. Farahat called on the international community to help open official crossings into Gaza and for the Egyptian government to fulfil pledges to establish a free trade zone between Egypt and Gaza. Hamas wants to reduce its dependence on Israel's blockade policies by increasing economic links with Egypt, but some Palestinian officials worry such access would encourage the party to bypass Fatah, which rules in the West Bank. Hamas officials have also urged Egypt to allow Rafah crossing to be used for goods also but Cairo has been reluctant to pursue changes to international agreements with Israel and other Western nations which stipulate that Rafah is only for travel.